CHICAGO -- Arctic temperatures, slick streets, blinding precipitation and increased travel during the winter season are key accident contributors. There are specific precautions drivers should take before striking out this winter. More tires are on the market are really winter tires not snow tires because they are designed to handle high water, ice and snow driving. It's important to note that with winter tires, you will need to change back to normal road tires in the spring. Windshield Washer Fluid: Make sure you have a winter fluid in your reservoir with Freeze protection to at least -25 F.
It's also important to check oil, cooling systems and belts. Cold weather can cause the fan belt to break and leave the driver stranded. Proper tire inflation and keeping your gas tank at least half full are also good preventive measures. One thing to always remember -- when driving in winter weather, expect the unexpected. "Drive defensively, keep a safe distance from the car in front of you, reduce your speed, make sure you have good visibility," said John Mitchell, IDOT emergency patrol manager. IDOT says one of the biggest challenges when a storm hits during rush hour is to convince drivers they're simply not going to get home in the same amount of time. Then there's the added complication of the salt trucks and snowplows. If you absolutely must pass, don't pass in the direction they are plowing. Even when trucks are not present, it's much safer to stay in one lane when you're driving through a snowstorm. "If you do break down during the storm, or any time for that matter, stay in your vehicle, if you have a cell phone dial *999, that will get you an operator, they'll ask your location, what the problem is and send you some help," said Mitchell. It doesn't take a lot of snow to create huge problems on the expressways, but when a major storm hits, driving attitudes have to change. "You want to use public transportation if you have to go someplace, if you really don't have to drive, we advise people not to drive in these kind of conditions," said Mitchell. Slow down, increase your following distance; you won't be able to stop as quickly when roads are snow covered and slick. Make sure you have good visibility, keeping your windshields clear of snow and ice. Don't change lanes, unless you absolutely have to. Take special precaution of bridges and ramps; they ice up quickly. Be extra careful around snow plows and salt trucks. During a major storm, IDOT will have over 300 snow removal vehicles on the expressways and they need to have the right of way. If winds kick up during or after the snowstorm, that presents another problem. "Blowing and drifting can be very dangerous. High winds tend to take some of the snow, we plow away and it can be blown back on the expressways," Mitchell said. 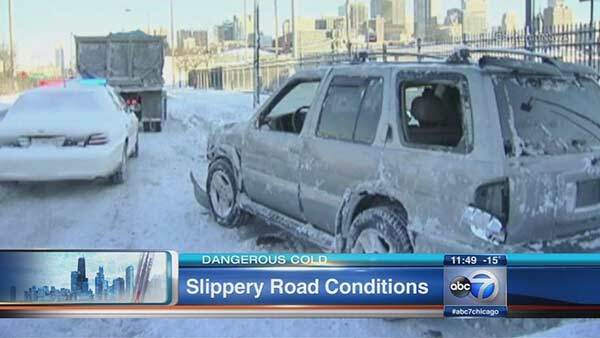 IDOT advises if you see trucks plowing in groups, do not cut in front of them. If you run into trouble during a storm, the IDOT minutemen will be out in full force, assisting with car crashes and other traffic incidents. Another good bit of advice -- keep a full tank of gas; the last thing you want is to run out in the middle of a storm.